/ How Does a Compass Work; Which Way is North? How Does a Compass Work; Which Way is North? Compasses are the single most important tool for the outdoor enthusiast but you will need to know how a compass works for it to work! Whether you're on the way for a long hike in the woods or half way through and lost, the compass will make sure you find your way back to where you need to be. Of course not everyone knows how to use a compass. That's where this guide comes in, making sure you know the basics of finding your bearings and how to read a compass. First off we need to know the important parts of the compass. The red needle that spins in the middle of the compass is, strangely enough, called the compass needle. This always points to magnetic compass North. It will have something to let you know which way is North, either a mark or a small letter n.
Next up we have a painted arrow on the base of the compass. This is called the orientation arrow. This is especially important when travelling whilst using the compass as you need to line up the compass needle with the orientation arrow. You do this by twisting the compass until both arrows align with each other and making sure you face that direction. So far you know how to find out where magnetic north is. What if you want to travel North West? Well on the side of your compass you should have a travel direction arrow. You move the dial around until the north west is level with your travel direction arrow. Make sure your compass needle and orientation arrow are still aligned with each other and walk in the direction your direction arrow is pointing. It's really as simple as that. There are a few other tricks you can use to make sure that you don't end up getting lost. Always hold it nice and flat so that the compass needle can turn properly. You also want to make sure that once you have found the direction you want to head in, don't just stare at the compass and walk. You will end up tripping over or walking head first into a tree. Once you have found the direction you want to head in, just pick a point in the distance and head towards it. Make sure you check your compass at regular intervals to keep on the right track. 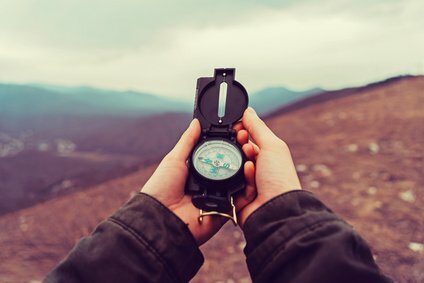 You can’t always rely on your GPS or your electronic phone for the digital compass, so you should go old-school and bring along a compass to guide you. Compasses can be a tricky tool to use if you don't know how but if you follow some simple tips, you'll be hiking up and down mountains and getting home again in no time at all. Heather – In a World where everything is digital, this is a very helpful article. We can’t always rely on technology and it’s good to know how to use tools like this. Keep up the good work! Old school is the best school! Thanks Sam. Appreciate the words. How to Break in Hiking Boots without Ruining your Feet! Best First Aid Kit for Camping: The Essentials You Need. What is Not Quite Wild? Not Quite Wild is for our favorite not quite wild outdoor adventures! If you want to venture into the great outdoors but don’t quite know where to start, then Not Quite Wild can help you find the best outdoor activities and products to get you started.